The Los Angeles United School District is building a new school on what has historically been the Virgil Middle School playing fields. Those fields were recently relocated to a new site north of the school. The relocation and new construction are parts of a school project that initially proposed removing a great deal of housing in the eco-village neighborhood… but that’s another story. Last week, as construction began, LAUSD removed about a dozen mature ficus trees along the sidewalk around the new school site. This includes large trees along the north side of First Street from Bimini to Westmoreland, and along the west side of Westmoreland Avenue from First to Council[edited 6/6/2011: and another half-dozen on Council Street, too]. Here’s a letter sent to the LAUSD by Zev, one of our newest residents. See this blog entry for more background on eco-village’s negotiations with the LAUSD, and how you can help out. Send your illustrated letter today! Many long-time friends of Los Angeles Eco-Village are aware that we’ve struggled with the Los Angeles Unified School District and its plans to demolish homes in our neighborhood to provide additional school space. Some of the past story is on-line here. We worked with the school district recently to modify plans for Central Region Elementary School #20 (CRES#20) that would have taken out more than 40 homes in the eco-village neighborhood. Though we stopped that plan, the current designs still call for a large (137 spaces) parking lot directly across from our main apartment building. The lot would level an existing hill on a now vacant lot where eco-villagers began gardening in the early 1990’s, and would have driveways ushering more cars onto the streets we’ve been working to make more pedestrian friendly. Change the design of the CRES#20 parking lot changed so that it fosters a safe, healthy, walkable community. Preserve the vacant lot / hill at the northeast corner of Bimini Place and White House Place, for future use as a garden. We’re asking our friends and neighbors to help us out by sending letters to our school board representative, the honorable Mónica García. A sample letter is below, though best to put it in your own words. Please keep letters brief, friendly and civil, as Ms. García has stated that she does support working with the neighborhood to make this project successful. I write to urge you to support changes to the designs for Central Region Elementary School #20 (CRES#20) that will foster a healthier and safer neighborhood for students, families, staff and the neighborhood. At a recent school district meeting you stated your interest in working with the community on this project. Please make good on your pledge. Please work with school district staff to redesign the project parking lot, planned at the corner of Bimini Place and White House Place. Please ensure that the parking lot design will preserve the safety and walkability of these streets. 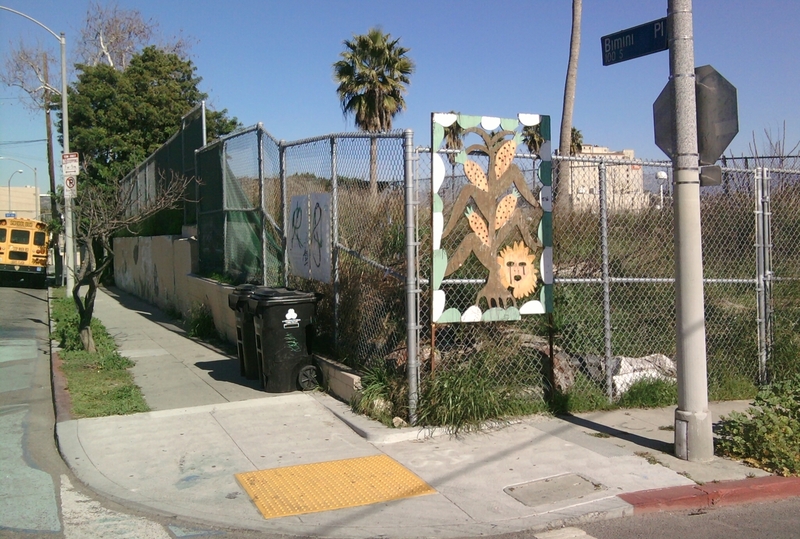 Additionally, please preserve the existing vacant lot hill at the corner for use as a garden. In the past this site served as a school garden, and I urge you to preserve the existing hill so that it can return to that use. Preserving this site can reduce the school district’s expenses, improve security, provide healthy food, enhance student learning, facilitate inter-generational collaboration, and reduce pollution. I urge you to act now for a healthier future for our kids, our families, and our communities. Thank you for your attention to this important matter. Thanks for writing your letters! Best to get your letters in as soon as possible – by no later than mid-July 2009. Keep your RSS tuned to the eco-village blog for future updates.